President Trump’s efforts to quickly deport more immigrants in the country illegally could hit a major hurdle if his administration is not able to bring on judges more quickly and move cases through the system more efficiently, with the current system producing a growing backlog. It currently takes more than two years for the Justice Department’s Executive Office for Immigration Review to hire new judges, according to a recent Government Accountability Office report. That has contributed to a backlog of more than half of a million cases awaiting adjudication, as of October. The backlog of pending immigration cases more than doubled between 2006 and 2015, GAO found, while funding increased steadily and the number of new cases remained flat. Even though staffing levels have increased 17 percent, EOIR has processed fewer cases each year. The median number of days to reach an initial decision in a case soared from 43 days in 2006 to 286 days in 2015. The office has about 1,000 full-time employees across 58 courts throughout the country. Judges hear testimony from immigrants and associated individuals the Homeland Security Department has slotted for removal, in addition to reviewing documentary evidence. The median case in the system’s backlog has been sitting for 404 days. Officials cited several reasons for the growing list of unheard cases, including an inadequate number of judges, insufficient clerks and support staff, funding shortages, a lack of translators and a surge of complicated cases involving undocumented children in 2014. They partly blamed the FBI’s security clearance process for the slow hiring, but GAO found that accounted for just 41 days of the more than 740 it took EOIR to fill vacancies between 2011 and 2016. 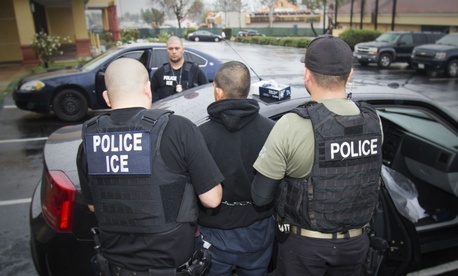 The Trump administration is already facing the consequences of the logjam; Immigration and Customs Enforcement arrested 37 percent more immigrants between Jan. 22 and April 29 compared to the same period in 2016, but removals dropped by 12 percent. Trump’s fiscal 2018 budget called for 75 more EOIR judges, but the agency has for years remained well below the staffing threshold authorized and funded by Congress due to hiring troubles. ICE acting Director Thomas Homan said last month he was not concerned with further overwhelming immigration courts, saying “we certainly think” the administration will eventually restore the deportation rate to that experienced under President Obama. Trump in January issued an executive order to “take the shackles off” ICE agents by eliminating restrictions on who should be deported and enabling more prioritized removals. Those efforts could be stalled, however, as GAO found EOIR does not have a long-term plan to deal with its staffing issues and the resulting case backlog. The agency has not addressed, for example, that nearly 40 percent of its workforce is currently eligible for retirement. Nor has it addressed operational issues causing a significant spike in the number of continuances, which is when a judge temporary adjourns a case until a later time. “By assessing its hiring process and developing a hiring strategy that targets staffing needs, EOIR would be better positioned to hire judges more quickly and address its staffing gaps,” GAO said. The auditors suggested EOIR take a more systematic approach to identifying workforce needs and addressing gaps by making specific targets and tracking progress. They also proposed creating “comprehensive case completion goals” and better oversight of information technology upgrades. EOIR officials mostly agreed with GAO’s recommendations and said they had taken steps to address them, but the auditors said the agency’s efforts so far have been insufficient.